Don't get us wrong, we love a good graphic tee. Wearing a band tee, designer logo, or a meaningful message is always a great way to express your personal style. But we are also firm believers that your wardrobe can never have enough classic, neutral tees. And believe it or not, not all plain tees are created equal. There's a variety of T-shirt styles, and your closet deserves each one. Whether you're looking for boxy, cropped, V-neck or classic fit, there is a tee in this roundup that fits every outfit need. Dressed up or down, these easy-to-wear style staples are necessary to every closet. Shop our list of the 20 best classic tees that go with everything below. This one is Kaia Gerber approved. I own this one in every color. Pair this with your favorite midi skirt and boots for a cool fall look. A worn-in tee that feels like you've owned it for years already. Nothing beats a classic cut black tee. So soft. Seriously, so soft. Trade your cotton tee in for the linen version. Pair this with your favorite lacy bra for a casually bold look. Who says your favorite T-shirt has to be white or black? The perfect level of tightness. A v-neck white tee is a wardrobe staple. For just $18, why not try more than one? An everyday pocket tee for max comfort. Cropped and boxy? We're in. We love the sleeve length on this one. Fits perfectly under your favorite maxi dress. 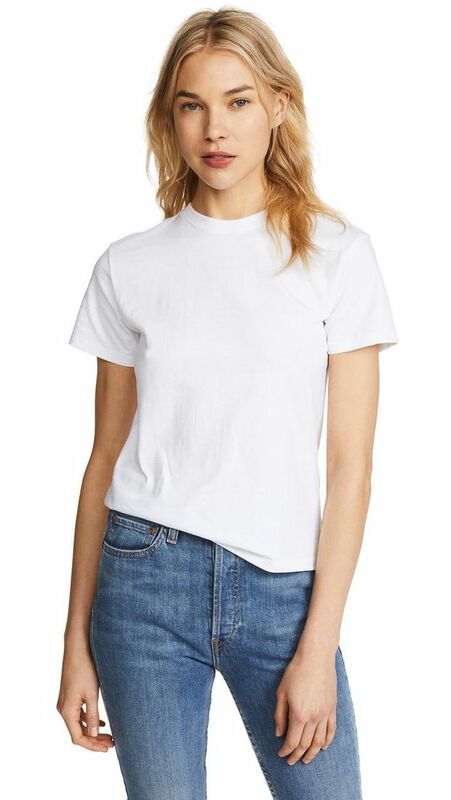 Front-tuck this tee for an effortless look. The extra long hem makes this tee perfect for running errands in your favorite leggings.